Readers have long cherished the work of comic masters such as Will Eisner, Jules Feiffer, and Art Spiegelman, all of whom happen to be Jewish. Few, however, are probably aware that the Jewish role in creating the American comic art form is no less significant than the Jewish influence on Hollywood filmmaking. Filled with the most stunning examples of this vital artistic tradition, Jews and American Comics tells us how the “people of the book” became the people of the comic book. 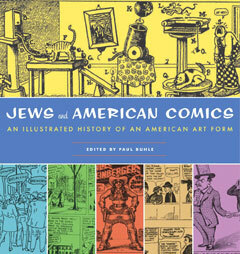 With three brief essays by Paul Buhle, the well-known historian of American Jewish life, Jews and American Comics offers readers a pictorial backstory tracing Jewish involvement in comic art from several little-known strips in Yiddish newspapers of the early twentieth century through the mid-century origins of the modern comic book and finally to contemporary comic art, which has at last found its place in museums, in private collections, and on the bookshelves of both critics and millions of avid readers. Featuring more than two hundred examples of the work of Jewish comic artists going back a century—much of which has been unavailable to the general public for decades—this extraordinary collection will be a major contribution to Jewish and American cultural history. Jews and American Comics is also a gorgeous package, sure to be treasured by comic art lovers and fans of Jewish culture—and destined to become the bar and bat mitzvah gift of the decade.